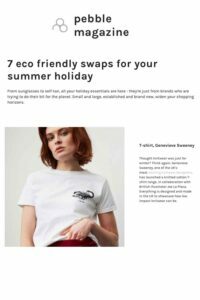 As seen in Pebble Magazines “7 Eco-Friendly Swaps for your Summer Holiday” the GS Tshirt! 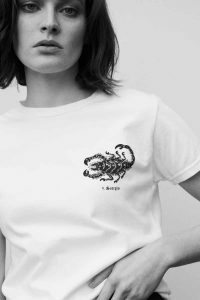 Featuring the first GS Summer Tshirt Collection in a Limited Edition Zodiac Collection. The white cotton t-shirts have been knitted and constructed in Nottingham at a family run factory, ensuring the highest quality heavy cotton. The t-shirts are easy to care for, machine washable, breathable and soft against the skin. Digitally printed in Leicester with certified inks that leave no residue. The perfect white t-shirt, that will last for summers to come and washes so well. Showcasing how low impact the Tshirt industry can be.